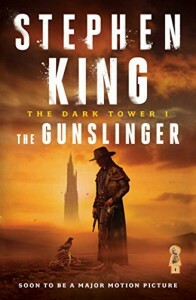 Roland of Gilead, the last gunslinger is on a mission to track the man in black whom he thinks will be able to tell him where the Dark Tower is. He journeys through a desert wasteland, encountering others along the way including Jake, a boy who has seen the man in black in a previous life and travels with the gunslinger as he closes in on his quarry. This was a bit hard to get into at first and it wasn't til the story of Tull that I became a lot more invested in the read. Roland is a complex character and not a straight out 'good' guy, his single minded obsession with the man in black sees him making some questionable choices that really test you as a reader. The world building is interesting and fairly sparse in some ways, you don't get a clear idea of what kind of world Roland is living in, part western, part medieval but with some modern touches brought in, it keeps you off balance and is a bit disorientating. The ending was a bit disappointing but I guess it's the end of the beginning of a much bigger story and not something to dwell on. I finished the book feeling unsure of who Roland really was but overall I enjoyed it a lot and am looking at picking up the next book in the series.